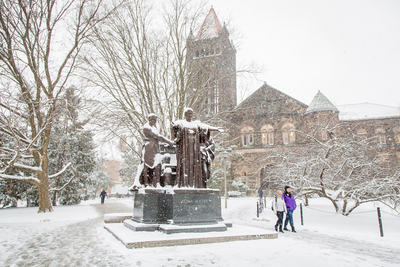 Students walk past the snow-covered Alma Mater sculpture. During the last 10 days of the month, average temperatures were 5 to 21 degrees below normal. Northwest Illinois experienced the most extreme departures from average. A National Oceanic and Atmospheric Administration cooperative weather observer at Mount Carroll in Carroll County reported a temperature of -38 degrees on the morning of Jan. 31. This unofficial temperature is currently under review by the State Extremes Committee, and if confirmed will be a new state record. The current record-cold temperature is -36 degrees recorded in Congerville in Woodford County on Jan. 5, 1999. In addition, multiple all-time station record lows were set in Illinois on Jan. 31. Some notable records included Moline (Rock Island County) with a reading of -33 degrees and Rockford (Winnebago County) with a reading of -31 degrees, as reported by the National Weather Service. With the two weather extremes, the preliminary average statewide temperature in January was 24.7 degrees, which is 1.7 degrees below the long-term average. Regions near and south of I-70 generally reported departures of 1 to 3 degrees above the long-term average. However, many locations in northern Illinois reported departures of 1 to 3 degrees below the long-term average, while the central portion of the state had near to slightly below average temperatures. Statewide average precipitation was 3.51 inches, which is 1.44 inches above the long-term average. The highest monthly rainfall total of 6.50 inches occurred at a station near Cobden (Union County), 1.5 inches of which fell in a single day on Jan. 5. Snow was abundant across the state in January, with all of Illinois recording at least some accumulating snowfall. The highest snowfall totals of 15 to more than 20 inches were common in west-central and northwest Illinois. These same regions generally recorded accumulations of 10 to 15 inches above the long-term average. The highest monthly snowfall total was from Moline in Rock Island County, where 30.2 inches was reported, or 20.8 inches above normal for January. Rockford in Winnebago County received 24.9 inches, which is 14.7 inches above the long-term average for the month. The Climate Prediction Center is forecasting an above-normal chance for a wetter-than-average February statewide. The highest probabilities are located toward the eastern side of Illinois. Below-average temperatures are favored for much of central and northern Illinois, with no strong signals further south.